The Zuiko Digital ED 50mm f2 Macro is a small and lightweight yet admirably sharp lens. Peak optical performance is achieved at f/4 and f5.6, but the lens is unusually sharp even wide open, and diffraction does not really start to eat away at detail until you hit f11. In fact, the only setting we would not recommend using is f22. Normally, you wouldn't use such a small aperture with a Four Thirds DSLR anyway – but with a macro subject, which sometimes requires you to stop the lens down as much as possible, this can occasionally be a problem. A case in point is the photograph of the dried rose in our Sample Images section. Shooting at f16, we still only got a few petals in focus, meaning we would really have needed the extra DOF achievable at f22, but the softness experienced at that setting has prevented us from using it. This issue, however, only affects certain shooting situations, and we have no intention of over-emphasising it. With most subjects, including most macro subjects as well, the lens performs phenomenally in the optical department. This is not restricted to sharpness. The 50mm Macro is also notable for its lack of any field-relevant corner shading, great control of geometric distortions (just consult our macro test target for evidence), and limited occurrence of lateral chromatic aberrations. Really the only area where the results aren't perfect is that of longitudinal CAs, most often noticed as green fringes in out-of-focus backgrounds. A maximum magnification of 0.52x may not sound like much for a true macro lens, but it does mean that you can fill the frame with a subject as small as 33x25mm – with a 35mm film SLR or a full-frame DSLR, you would need a 1:1 macro to achieve a similar result. For this reason, and in light of the great optical performance, we would encourage Olympus to offer a slide copying attachment as an optional accessory for this lens – this would enable photographers to use the combination of the 50mm Macro and a high-resolution Four Thirds or Micro Four Thirds body for quick and easy digitisation of 35mm slides. As for the existing accessories, it need be noted that the addition of the EX-25 macro extension tube to your kit allows you to increase the magnification to 1:1, should you feel a need for that. The lens scores top marks for build quality and overall handling, too. Features, on the other hand, are something of a mixed bag. 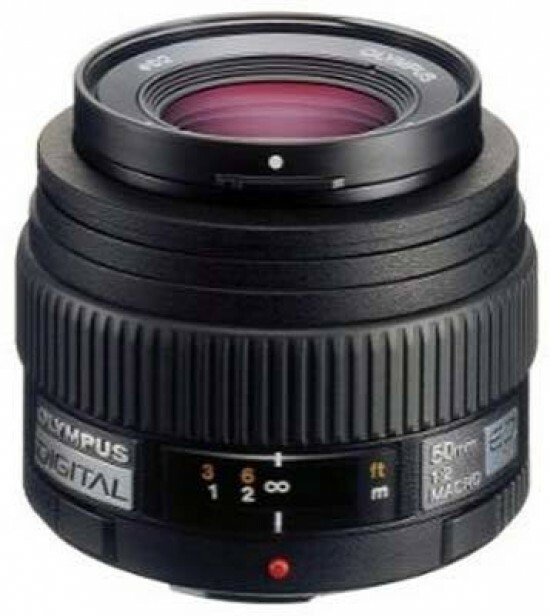 The weather sealing is definitely a big plus, at least for owners of the Olympus E-1 or E-3 digital SLRs, which are similarly splash- and dust-proofed – but the lens gets marked down for the lack of a magnification scale and, even more importantly, a focus limiter. The latter can cause problems when using autofocus, as it may lead to excessive hunting. Factoring in everything, including the relatively moderate cost for what is unquestionaly a pro-grade lens, the Zuiko Digital ED 50mm f/2 Macro proves to be a versatile multi-purpose optic that easily earns our Highly Recommended rating.